Since 2014, over 1.4 m people have applied for asylum in Germany. Less than 20% are currently employed (2017, Source 1); of those employed, many of them are in low-skilled jobs that do not match their skills or ambitions. Entrepreneurship can provide an immediate and direct path to self-sufficiency and becoming a contributing member of society. However there is another level to the challenge facing Germany today. Berlin fancies itself a global start-up hub, however the scene has produced few real success stories. Part of the reason is the homogeneity of Germany's entrepreneurial ecosystem: the best innovations require a mix of diverse perspectives and experiences, and only ~10% of German start-up founders are foreign born, compared to 30%-50% of founders in Silicon Valley. In order to kickstart innovation, the scene needs to be made more inclusive and more people with new viewpoints, diverse life experiences, and with an appetite for risk must participate. 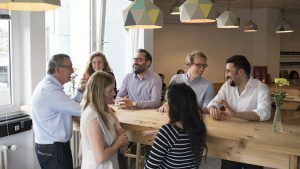 Germany is fortunate to have accepted over 1 million such people: many of these newcomers already have entrepreneurial experience (according to Worldbank data, nearly 40% of Syrians were self-employed in 2015, compared to ~10% of Germans, Source 2), and now it’s critical that we unlock the innovative potential they bring with them. 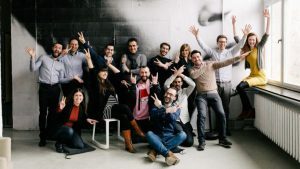 SINGA Business Lab is an inclusive incubator based in Berlin and recently also in Stuttgart and co-created with newcomer entrepreneurs to support them to found successful, innovative, and scalable businesses. We believe that we can unlock the innovative potential that refugees bring with them by enabling their access to Berlin’s and Stuttgart' already world-class entrepreneurial ecosystem. And we believe that this is not just a key piece to successful economic and social integration, but that the new ideas and perspectives newcomers bring will also increase the innovativeness of the entire ecosystem. We do not believe in using a "2nd tier" of service just because we are non-profit; using leading incubators as our benchmark, we provided the best and latest methods, tools, and expertise. We encourage participants to build innovative and scalable businesses, and provide the content and networks to work towards those ambitious goals and meet the high expectations we set. 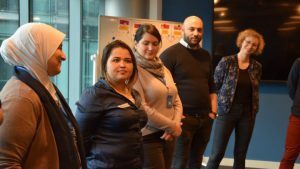 We used a user-centric design method to co-create the program with newcomer entrepreneurs, to ensure that our offering is comprehensive and suited to their specific needs. Beyond providing services and content, we teach our participants how to think, act, and innovate like entrepreneurs. Bote: led by Raafat Hantoush, Bote is a smart shoe insole that allows parents to keep track of their children using their smartphone, winner of the Jusoor 2018 Global Entrepreneurship Competition. Niuversity: led by Fadi Shalabi, Niuveristy is a digital educational platform offering marketable skills to Arab youth in their native language, winner of the Comenius EduMedia award. Reviving Home: led by Hadi Soufan, Reviving Home is a crowdfunding platform for rebuilding cities destroyed by war, winner of the IHK’s WE DO DIGITAL 2018 Award. In August 2018 we opened up our program to the community: interested newcomers can freely attend whichever classes and workshops they need so we can increase the number of entrepreneurs we are able to reach and support, as we have found that many of our entrepreneurs are committed to their ideas but need more flexibility. We will also provide an Accelerated Track with a greater time requirement for the most committed entrepreneurs. Check out our website for more information about the program, the entrepreneurs, and their businesses! The business incubator was the perfect program to help me start my business and enter the world of entrepreneurship. It provided me with training in the fields I needed to know and limitless networking opportunities. If you have a dream to achieve, SINGA Business Lab is the bridge to achieve your ambitions! Before the Business Lab, I was unsure if my business could be successful or if I would have a future in Germany. The Business Lab supported me through all of the required steps, and taught me how to succeed on my own – it was exactly what I needed!